The Ralph and Marie Ecton Memorial Triples is open to both men and women. Skips set up their teams any way they want. The entry fee is $75.00 per team. Lunch is brown bag. Morning snacks and salads and desserts will be provided at lunch time. Format is three 12-end games. There will be four winning teams. Wins are determined on the basis of wins, losses & plus points, with a max of 7 points per game. When there is a point tie of the first four finish places the following will be used to break the tie. 1. Head to head results, if Any. 2. Fewest opponent's points allowed. 4. One end roll - off. Prizes will be awarded for all four places. Lunch was served after the second game. Sandre Adame organized the food with the kitchen help of Carol Smith, Pinky Palladino, Kathy Corona and Marie Moore. Several others also contributed food. It was a very warm day and we went through lots of bottled water which helped to keep everyone hydrated. Howard Horowitz provided a large display of Aero Bowls and associated equipment which drew quite a bit of attention. There were twelve teams from various clubs throughout So. Cal. including four teams from Oxnard. 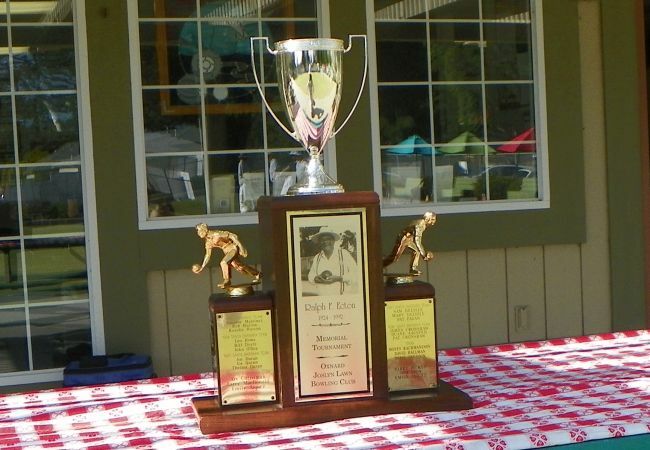 The Ecton perpetual trophy. The winning team each year has their names engraved on it. while fighting cancer and has since passed Away. Barry and Bud will be retiring from tournament play. Jack Bucey and Terri Mar watch as head develops. Victor Green with decorator socks. He loves color. Marquita's family brought his camera and took lots of pictures. Luke Wilson, expectant father Henry Otineru and Shelley Cohen. Denny Ryan And Rich Purcell keeping a close eye on things. Sue Sullivan about to bowl as Brent Boone measures in next rink. Jack Bucey and Brent Boone enjoy the shade on a warm day. Marquita Otineru. Time to get the feet up. Only 4 more weeks now. selection taken from a much larger group of photos Sam took on Tournament Day. Stuart Bell and Shelley Cohen on near rink. Check out the intent bowlers. Looking down walk on west side of green. Luke Wilson displays perfect form. Terri Mar measures for point. Howard Horowitz and James Flower direct their teams. Thanks to all that competed and we hope to see you next year.